What’s Worse: Trump’s Campaign Agenda or Empowering What’s Worse: Trump’s Campaign Agenda or Empowering What’s Worse: Trump’s Campaign Agenda or Empowering What’s Worse: Trump’s Campaign Agenda or Empowering | "Global Possibilities"
Generals and CIA Operatives to Subvert it? 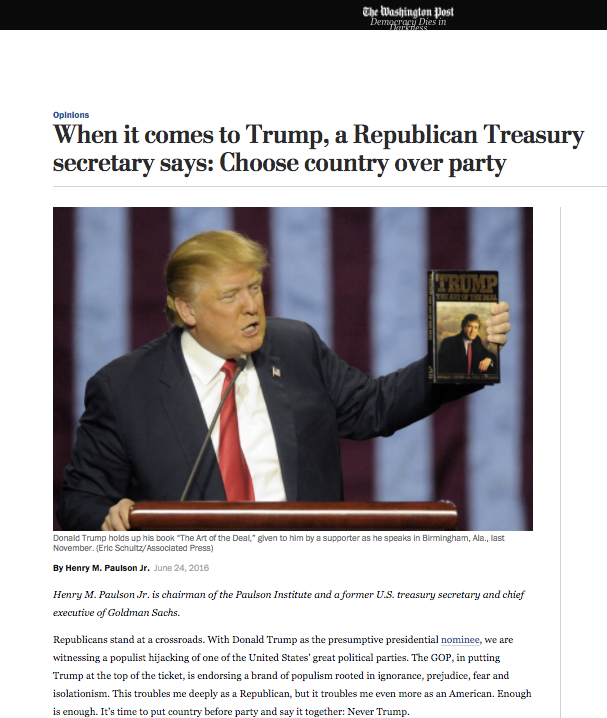 Hank Paulson, former Goldman Sachs CEO and George W. Bush’s Treasury Secretary, went to the pages of the Washington Post in mid-2016 to shower Clinton with praise and Trump with unbridled scorn, saying what he hated most about Trump was his refusal to consider cuts in entitlement spending (in contrast, presumably, to the Democrat he was endorsing). “It doesn’t surprise me when a socialist such as Bernie Sanders sees no need to fix our entitlement programs,” the former Goldman CEO wrote. “But I find it particularly appalling that Trump, a businessman, tells us he won’t touch Social Security, Medicare and Medicaid.”Some of Trump’s advocated assaults on D.C. orthodoxy aligned with long-standing views of at least some left-wing factions (e.g., his professed opposition to regime change war in Syria, Iraq/Libya-style interventions, global free trade deals, entitlement cuts, greater conflict with Russia, and self-destructive pro-Israel fanaticism), while other Trump positions were horrifying to anyone with a plausible claim to leftism, or basic decency (reaffirming torture, expanding GITMO, killing terrorists’ families, launching Islamophobic crusades, fixation on increasing hostility with Tehran, further unleashing federal and local police forces). Ironically, Trump’s principal policy deviation around which elites have now coalesced in opposition – a desire for better relations with Moscow – was the same one that Obama, to their great bipartisan dismay, also adopted (as evidenced by Obama’s refusal to more aggressively confront the Kremlin-backed Syrian government or arm anti-Russian factions in Ukraine). Nonetheless, Trump, as a matter of rhetoric, repeatedly affirmed policy positions that were directly contrary to long-standing bipartisan orthodoxy, and his policy and personal instability only compounded elites’ fears that he could not be relied upon to safeguard their lucrative, power-vesting agenda. In so many ways – due to his campaign positions, his outsider status, his unstable personality, his witting and unwitting unmasking of the truth of U.S. hegemony, the embarrassment he causes in western capitals, his reckless unpredictability – Trump posed a threat to their power centers. It is often claimed that this trans-partisan, elite coalition assembled against Trump because they are simply American patriots horrified by the threat he poses to America’s noble traditions and institutions. 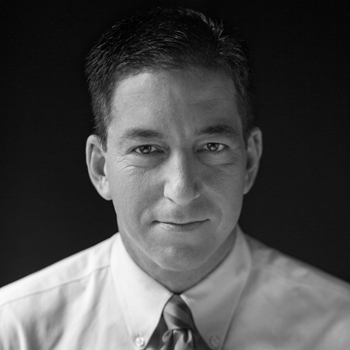 I guess if you want to believe that the CIA, the GOP consulting class, and assorted D.C. imperialists, along with Bush-era neocons like Bill Kristol and David Frum, woke up one day and developed some sort of earnest, patriotic conscience about democracy, ethics, constitutional limits, and basic decency, you’re free to believe that. It makes for a nice, moving story: a film from the Mr.-Smith-Goes-to-Washington genre. But at the very least, Trump’s campaign assaults on their most sacred pieties was, and remains, a major factor in their seething contempt for him. From the start of Trump’s presidency, it was clear that the permanent national security power structure in Washington was deeply hostile to his presidency and would do what it could to undermine it. Shortly before Trump was inaugurated, I wrote an article noting that many of the most damaging anti-Trump leaks were emanating from anonymous CIA and other Deep State operatives who despised Trump because the policies he vowed to enact – the ones American voters ratified – were so contrary to their agenda and belief system. Indeed, they were even anonymously boasting that they were withholding secrets from Trump’s briefings because they decided the elected President should not have access to them. Other journalists, such as Peter Dale Scott and Mike Lofgren have long written about the U.S. Deep State completely independent of Trump. 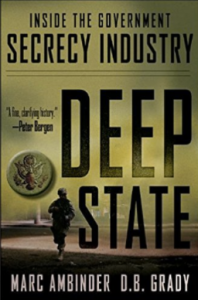 The belief that the “Deep State” was invented by Trump supporters as some recent conspiratorial concoction is based in pure ignorance about national security discourse, or a jingoistic desire to believe that the U.S. (unlike primitive, inferior countries) is immune from such malevolent forces, or both. Indeed, mainstream liberals in good standing, such as the New Republic’s Jeet Heer, have repeatedly and explicitly speculated about (and, in Heer’s case, warned of) the possibility of Deep State subversion of the White House. That the U.S. has a shadowy, secretive world of intelligence and military operatives who exercise great power outside of elections and democratic accountability is not some exotic, alt-right conspiracy theory; it’s utterly elemental to understanding anything about how Washington works. It’s hard to believe that anyone on this side of a 6th Grade civics class would seek to deny that. The last several weeks have ushered in more open acknowledgment of – and cheerleading for – a subversion of Trump’s agenda by unelected military and intelligence officials. Media accounts have been almost unanimous in heralding the arrival of retired Marine Gen. John Kelly as White House Chief of Staff (pictured, top photo), widely depicted as a sign that normalcy is returning to the Executive Branch. “John Kelly Quickly Moves to Impose Military Discipline on White House,” the New York Times headline announced. The current storyline is that Kelly has aligned with Trump’s National Security Advisor, Army Lt. Gen. H.R. McMaster, to bring seriousness and order to the White House. In particular, these two military men are systematically weakening and eliminating many of the White House officials who are true adherents to the domestic and foreign policy worldview on which Trump’s campaign was based. These two military officials (along with yet another retired General, Defense Secretary James Mattis) have long been hailed by anti-Trump factions as the Serious, Responsible Adults in the Trump administration, primarily because they support militaristic policies – such as the war in Afghanistan and intervention in Syria – that is far more in line with official Washington’s bipartisan posture. But there’s no denying that Trump is deluged by exactly the kinds of punishments which Schumer warned Trump would be imposed on him if he continued to defy the intelligence community. Many of Trump’s most devoted haters are, notably, GOP consultants; one of the most tenacious of that group, Rick Wilson, celebrated today in the Daily Beast that the threat of prosecution and the tidal waves of harmful leaks has forced Trump into submission. The combination of the “Goldman Boys” and the Generals has taken over, Wilson crows, and is destroying the Bannon-led agenda on which Trump campaigned. But hers was clearly the minority view: the military triumvirate of Kelly, Mattis and McMaster has been cast as the noble defenders of American democracy, pitted against those who were actually elected to lead the government. In terms of some of the popular terms that are often thrown around these days – such as “authoritarianism” and “democratic norms” and “U.S. traditions” – it’s hard to imagine many things that would pose a greater threat to all of that than empowering the National Security State (what, before Trump, has long been called the Deep State) to exert precisely the power that is supposed to be reserved exclusively for elected officials. In sum, Trump opponents should be careful of what they wish for, as it might come true.